Coup de foudre, indeed. That’s a French expression that literally means a bolt of lightning. But figuratively, it is an expression of love at first sight. We are arrived in Québec City, one of the most handsome cities of the New World, partly because of geography, partly because of history. This is a very European, very French city, the cultural heart of the province of Québec. 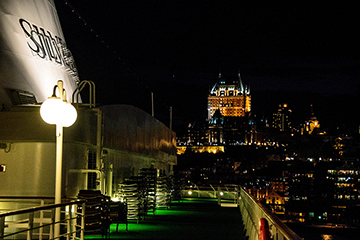 We will be making four calls in Québec City on this series of cruises and we have visited here dozens of times in the past. If you think that is a recipe for boredom, you’re quite wrong. There are still more corners to explore, food and wine to taste, cobblestones and carvings and wall murals to admire. Québec City region is home to more than 700,000 people. That’s about one-sixth the population of metropolitan Montreal, which has four million residents, two million in the city itself. 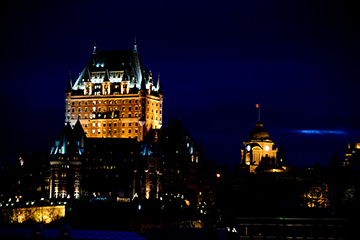 It is Québec City, though, that is the political and cultural capital of the Canadian province of Québec. 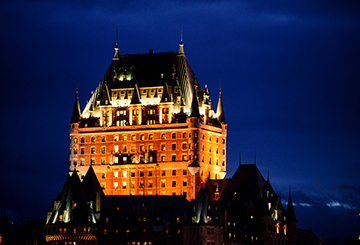 Québec City is the most European city in North America, more French than Paris in many ways. While Montreal is a large city that happens to mostly speak French . . . Québec City is a defiantly French place. Defiant despite the fact that the battle that broke the hold of the mother country on New France took place here on the Plains of Abraham. Defiant in the face of the British who tried to change not just the government but also the culture. Defiant against the Americans who rose to power to the south and who fought—first with armies and later with movies and television and McDonald’s. And, it must be said, defiant in many ways against the First Nations who were living here . . . for centuries or longer before Jacques Cartier arrived in 1534. Politics and history aside, Quebec City is one of the most spectacular cities in the world.